‘off-the-peg’ wedding dresses are either new or ex-sample gowns and have only ever been tried on in our boutique. They are sold as seen. 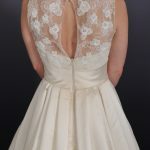 Some of our ‘off-the-peg’ gowns may have slight defects , most of which are repairable but we will notify you of any that we are aware of but it is customers’ sole responsibility to check . These imperfections are reflected in our prices. Alteration costs required are the sole responsibility of the customer we will not be liable for any damages may these occur. We do recommend highly talented seamstresses and all consultation and fittings will take place in our boutique. This service is between the customer and the seamstress. You are always welcome to find your own seamstress. We do not offer refunds on ‘off-the-peg’ gowns as they are sold as seen. If you do change your mind please contact us within 7 days of purchase and we can discuss exchange options. Display veils and accessories are sold as seen and cannot be exchanged or refunded. New Veils or accessories require 50% non refundable deposit before ordering and payment in full upon collection. Refunds on new ordered items cannot be given unless faulty. Bridesmaid dresses require a 50% deposit before ordering and payment in full upon collection. 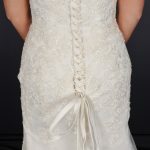 Alterations are available with our seamstress and all consultations and fittings will take place in our boutique. This service is between the customer and the seamstress. Alteration costs required are the sole responsibility of the customer we will not be liable for any damages may these occur.